We had been drawn to rusted metal garage doors for several years. We called Overhead Door Co. of Tucson and Southern Arizona, Inc. Art Alcon came to evaluate our garage door and give us an estimate. He took the time to listen to our concerns and prepared an estimate based on our conversation. During our conversation with Art, we indicated that we would also like to discuss a new garden gate that was located next to our garage door. We didn’t really have it in our budget, but thought it would be a great addition to our property. Art suggested that we re-use our lift mechanism and use the savings to have him construct a new gate. This allowed us to afford a new gate by using our old lift motor to the very end. Additionally, Art took the time to talk about the natural, unfinished metal he uses on his rustic doors. He does not seal the surface. The rust on his doors is live, organic and natural. It continues to gather a lovely patina that we enjoy watching develop over time. The patina on nearby surfaces adds to the whole casual, rustic theme that we work so hard to pull together. Long story short, we were pleased with Art’s laid back approach and willingness to spend time answering our questions. His company performed on-time and on-budget. His installation crew was courteous and did a good job. I recommend Overhead Door Co. of Tucson and Southern Arizona, Inc. to my friends, family and clients. We contacted Overhead Door Co. of Tucson and Southern Arizona and they came out to our home the very next morning to discuss our options. They provided pictures they had taken (at yearly intervals) of the rusted doors they had installed in other neighborhoods, and the doors just kept looking better and better as they aged. I was nervous about the asking price, but was pleasantly surprised! No one could beat the price or the good looks of the rusted door we chose. The installers were prompt, professional and so very helpful in explaining what we needed. The door even sounds like a dream… so quiet! 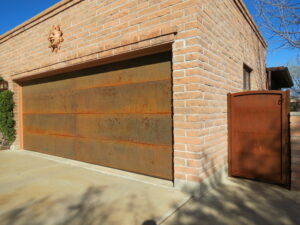 We are so very happy with our rusted garage door! We are SO SOLD on Overhead and couldn’t be more pleased with the outcome! Our garage door was installed in 2001, and nothing had ever broken on it, so it was due for some TLC. The spring breaking was the reason for the service call, and Overhead Door Company of Tucson provided same-day service. I called about 10 AM, and they were at the house about 2 PM – right in the middle of the 1-3 time window they had given me. The service technician was very professional and thorough. He checked every part of the door, and in addition to replacing the broken and old springs, he made a suggestion to replace the original plastic wheels with the better quality, lifetime guaranteed nylon/ball-bearing ones, but was not high-pressure at all. We took his advice and had them replaced. He was finished with the entire job in a little less than an hour. I would definitely hire this company again. Earlier this year I purchased a town home in Tucson, built in 1986. The garage door and operator were the original. The door needed to be replaced because it would hardly slide in the tracks. My contractor recommended Overhead Door Company of Tucson. They had the best price as well as being able to match to color on the previous door. The door was installed and serviced expertly and professionally. Throughout this whole process the communications with the company was excellent. 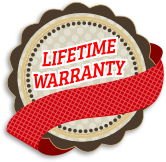 I would definitely use Overhead Door Company of Tucson again and I would definitely recommend them to my friends. 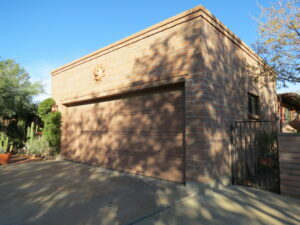 We called Overhead Door Company of Tucson to refurbish our 27 year old garage door. The door and spring were in good shape but it needed new insulation and door opener motor. They came for an estimate the next day and we liked what they could do for the door and the price. We are so pleased with the final product and service. The new insulation looks great and the motor is so quiet that we have look to make sure the door is moving. We highly recommend Overhead Door Company of Tucson. Our commitment to Overhead Door is a reciprocal relationship that is unique in this industry. As a vendor we expect a great deal of product commitment from ‘’Overhead Door’’ and in return they expect this commitment from us to our customers. It is this industrial culture that has sustained our integrity these many years. As we both have a vested and monetary stake in the satisfaction of our customers. We as a distributor and Overhead Door corporation are aware that you are most important to us, that we are dependent on you, you are the purpose of our work, you are deserving of the most courteous and attentive treatment, that you have a vested interest in us when you call and we are not doing you a favor when you call, we are here to listen to your questions, and without you we cease to exist. And only when we exceed our customer’s expectations do we meet our own.